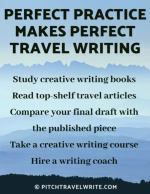 In the past ten years of travel writing I’ve checked out many online resources for travel writers. Although I’ve abandoned some, I still refer to many of them. Tripatini is a fun, free, social network, and blog where travelers and travel experts from across the planet hang out, share, and learn how to travel better and smarter. 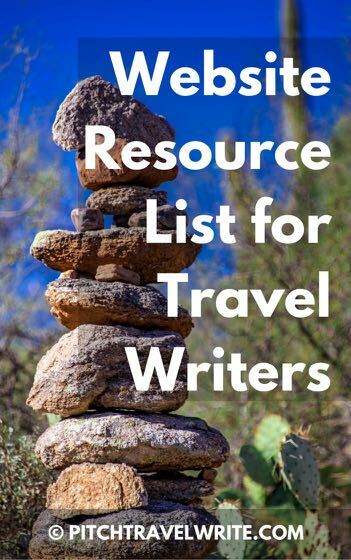 It’s kind of a hold-all resource for travel writers. Tripatini.com is on this website resource list because it offers the following benefits, all for free . . . This is one website that always brings a smile to my face! RoadsideAmerica.com is a caramel-coated-nutbag-full of odd and hilarious travel destinations -- over 10,000 places in the USA and Canada -- ready for exploration. Road trip know-it-alls Doug Kirby, Ken Smith and Mike Wilkins introduced readers to the world of offbeat tourist attractions with their books, Roadside America, and New Roadside America. It’s been on the web since 1994, and also has a mobile app. Produced by Ashley Gibbons, this meaty website presents ITWA, the world’s largest association of professional travel journalists (10,300), with links to more than 2,000 travel industry reps.
ITWA represents journalists with a genuine and professional interest in travelling worldwide to write or produce travel information for other media. The Alliance also works closely with representatives of the travel and tourism industries worldwide. Travel Massive, primarily a travel blogger’s platform, is the world’s largest network (31,790 members) of travel industry change makers who want to make travel better in more than 174 countries. Travel Massive is on this website resource list because it can help you with . . .
Travel Classics is primarily for writers that have attended the annual Travel Classics West conference held in AZ or Ireland. The Media Newsletter lists tips, trips, and happenings from friends of the Travel Classics Writers Conference. 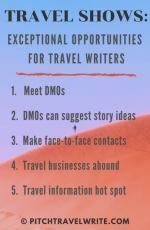 Primarily for San Francisco travel writers, Travel Writers News lists editorial opportunities, calls for submissions, classes, travel-related websites, readings by travel writers, and news about local travel writers’ current projects. It’s on this website resource list not only because it offers a useful calendar of upcoming events—it also helps people stay in touch and attend each other’s readings and classes, building our growing SF Bay Area community of travel writers and photographers. The What Travel Writers Say webzine was initiated and constructed in mid-April, 2007 by two brothers, Mike, and Pat Keenan. Content for the site was initially derived from just a handful of TMAC (Travel Media Association of Canada) professional writers. 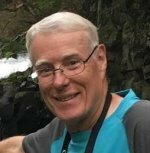 They feature 119 writers from SATW (The Society of American Travel Writers) and TMAC who have contributed close to 1,000 articles on travel destinations around the world. The Written Road is run by a slew of talented, budding travel writers and editors and offers a unique and refreshingly honest view into the life of emerging careers with day-by-day accounts of the process of changing from an unknown to an accomplished professional. It's on this website resource list because you’ll find practical discussions of market leads, author events, marketing tactics, travel books, a writer’s philosophical quandaries, and perhaps most importantly, a few inspirational triumphs. Readers most enjoy news of notable writers, new travel books worth reading, submission guidelines, and the individual support they receive. Want to keep updated on special events around the world? McKenzie News Service offers information about food, wine and spirits festivals, film festivals, cultural events, museum events, adventure travel & tours, press releases, and more. Travel and Tour World (TTW) is a travel trade media information platform. An all-inclusive and far-reaching travel trade magazine with a readership of more than 2,50,000 worldwide, the magazine is the media partner of more than 100 travel and tourism trade shows.